Emaximm® is a web based application specifically tailored for controlling and tracking all the activities for your practice, division or enterprise using a single web address. It is a practice productivity tool, and is aimed at organizations with multiple cases for visas and immigration. Because of its light design and powerful server-side technology, Emaximm® is not limited to small or large practices. The Emaximm® Web Application program allows for the on-line entry, storage, updating and sharing of immigration data. In addition to minimizing the paperwork required by a typical immigration case, the on-line program modernizes the entire process making it faster, more efficient and easier to complete. Designed for use by immigration attorneys, client companies and applicants, this software allows for an easy and efficient method of applying for immigrant visas, non-immigrant visas, and citizenship to the United States . Using this application, new clients can find you and interact with you online from your own location. 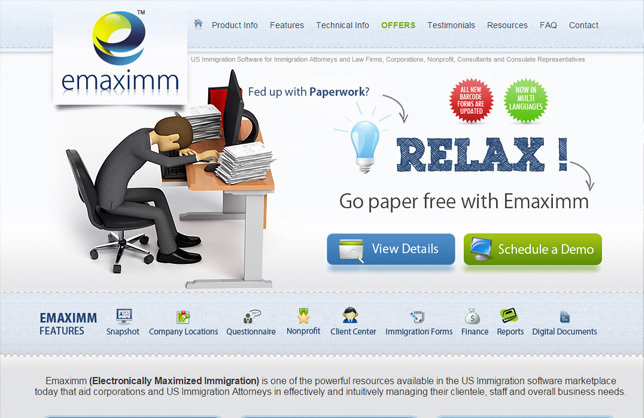 Emaximm® is one of the strongest and most powerful resources available in the software marketplace to help immigration attorneys effectively and intuitively manage their clientele, staff and overall business needs. Rich in features, Emaximm® goes even further than competing products in this industry to help attorneys easily handle the full 360 scale of their practice, with simple automated mechanisms. This software enables the immigration attorneys to streamline their practices and exceed their goals.